AMSOIL drawing, check it out and enter here. This is a discussion on AMSOIL drawing, check it out and enter here. within the Amsoil forums, part of the Preferred Vendors category! Hey everyone, thought I would add a little something to the forum. 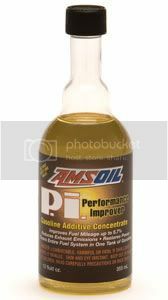 From now until March 11, 2012 everyone will have a chance to win a bottle of AMSOIL PI or an AMSOIL Pro Racing T shirt. The PI is a fuel system cleaner that is recommended to use once every 4k miles to keep you fuel system clean. You must post ONE (and only one) post in this thread to register. Your post number in the thread will be your "entry ticket number" for this drawing. Sound simple enough? Remember only one post. Here is the two choices of prizes. I will post the winner and from there they will just let me know which one they want and if it is the shirt what size. They can then PM me their address for delivery. Thanks Nick & Sign me up! It would be nice to win something. Everyone congratulate oleg1981 as the winner! oleg1981, pm me which prize you want and a mailing address and I will get this right out to you. Congrats! Your shirt is on its way. You should get it by Friday I would think. got the T-shirt! many thanks! Wow, that took a long time. I wonder why. Glad you got it.